At first glance it would appear that in the Froch/Groves fight last Saturday, George Groves was robbed too early in the fight. On second glance, it wculd also be conceived the other way round. Groves was clearly winning the fight up to the that point, 10/8 round to Groves in the first round and won most of the rounds after that until the 9th round. Froch was slow and messy, Groves was sharp and to the point until the 6th round, at that point Groves power seemed to fade, decent combos deflected off the side of Froch’s face like we have seen from everyone who has fought him in the past. At this point Froch, inside his head, was sure that Groves could not hurt him anymore, he had lost his power and was starting to fall apart, and Groves did… in the 8th and 9th round Groves was messy, getting caught and coming off worse in the combos exchanges as far as damage done is concerned, Carl was taking what Groves had and it had no more effect on him. In the 9th round they traded blows against the ropes, they both backed away and as they came together again Froch ducked his head down and swung a high hay-maker that caught Groves on top of the head, Groves stopped and tried to hang on to Froch. Carl knew he had his man hurt, Groves clamped down on Carl’s glove under his arm and Carl pounded away with his loose hand. The ref pulled them apart and George backs off to the ropes, as Froch comes, Groves swings but misses, Froch however lands some straight shots that rock Groves. He comes off the ropes to a right left and right hook, these shots leave Groves doing nothing, head down and shoulders slumped and the ref jumps in and holds up and saggy Groves, everyone feels hard done by. Now look at it this way, Groves was hurt, Froch was clean and crisp, without a doubt Froch was going to keep punching with Groves offering nothing in return and most people know at this point it was downhill for Groves. The ref saved Groves from being dropped and losing the fight by a clear KO, that’s what Carl does, Carl was robbed of this opportunity. Robbed of another incredible comeback KO victory, another for the history books on great comebacks. Groves was saved, sparred from loss. Groves walked away with credit for the performance and a so called robbery, Froch got very little from that despite being very close to dropping Groves and being clean of negativity. Froch was robbed here too, so was Groves, he had earned the right to be put on his back, dropped flat and carried out… both fighters could have taken 50% of the credit each, Groves for the effort and Froch for the win by epic comeback. 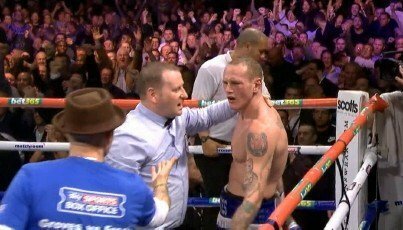 Both fighters were robbed that night, but for me, Groves was sparred the thought being tattooed into his brain of “how the hell did I let that slip away from me”. Froch and his chin, that’s what. Froch coming back and dropping Groves was just 10 seconds away, watch the replay, no reply from Groves, head dropped, arms doing nothing. If Groves was fine to carry on, then why was his not slipping the punches, moving out the way, blocking them like he was 8 rounds before? Because he was done, spent and about to get bashed by Froch. What would Groves prefer? Being dropped and it being clean and clear that Froch was too hard for him and no need for a rematch because Groves gave everything and his very best and still could not beat Froch? Of course Groves prefers that he gets stopped too early and be given the opportunity to put on an act like he was ok and redeem the efforts he put in? I’m sure in that light Groves would have preferred to get stopped early and get another go. You could always argue that Groves was OK and could have carried on but in that case why was Groves getting hit and hanging on and not throwing back? Such a contrast from the last 8 rounds, he must have been hurt. Should Froch have been stopped in the first? Froch got up, shook it off and carried on. Groves had his chance, Groves should have jumped in and given his best, but he never did. Everyone predicted that Groves would steal the early rounds, and he did in epic fashion, and that Froch would come back late on and stop him, and that’s what happened, what everyone was moaning about was that they wanted to see Groves getting dropped in a natural conclusion. Should Groves get put down and then also deserve the right to get back up? Of course he did and that’s all Groves was robbed of, but Groves is not Froch… that chin is something else and Froch for sure would have punched until Groves was either canvas pizza or Froch’s own heart stopped beating from effort.